If your days seem bleak now that February gives us a hard landscape of frozen ground and barren trees, ( what about that Winter garden you are always planning and never execute?) I suggest a trip to your favorite nursery’s greenhouse (although those wonderful Mom and Pop shops seem to be disappearing around the country.) 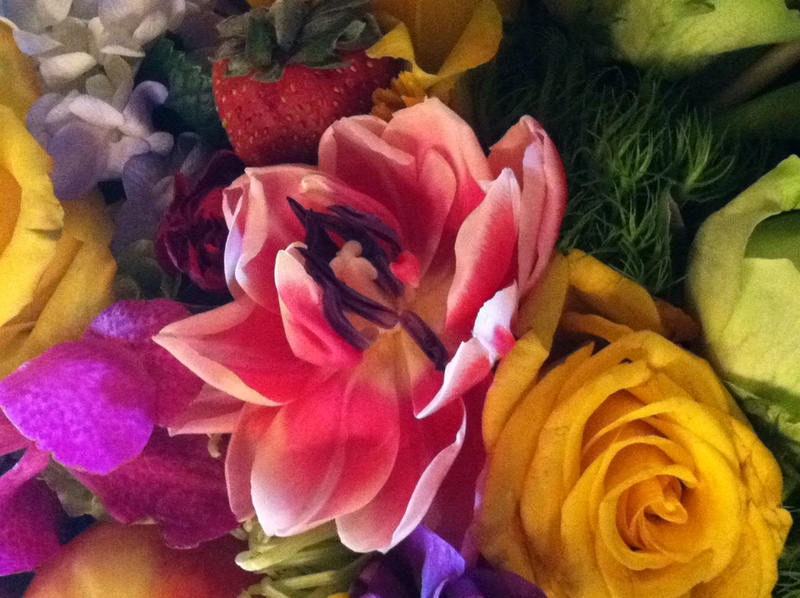 Or perhaps your Garden Club is offering a flower arranging talk! Mine was, yesterday! 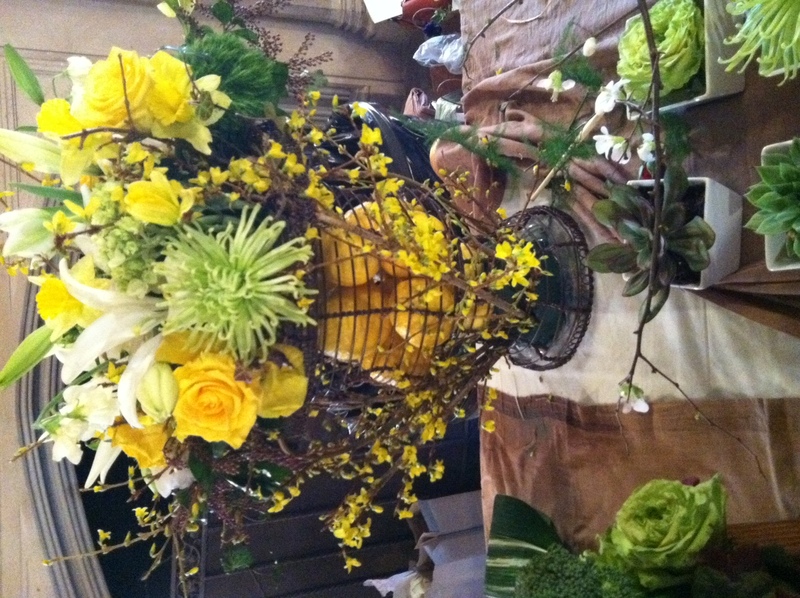 We were excited to have Miriam Landsman come with glorious flowers to show us unique ways of using flowers in the home. I think even I could manage to execute the design above! Miriam is associated with Garden Education Center of Greenwich where you will find Spring programs and events to thrill the flower arranger and the grower alike. They had bonsai in January, orchids and terrariums in February, dahlias and pruning in March – plenty to get gardeners without greenhouses through the Winter months. Flower prices soar the week of Valentine’s Day but a bunch of tulips might not break the bank…or three….. This entry was posted in Uncategorized and tagged flower arranging, Garden Education Center of Greenwich, Miriam Landsman. Bookmark the permalink. Some lovely ideas there – especially the tulips in glasses – no need for a big bunch to make an impact. 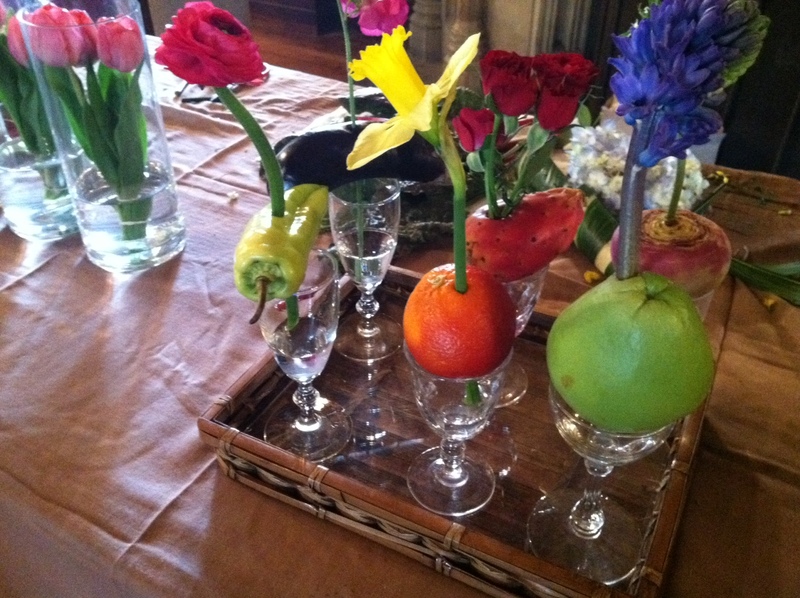 Interesting concept of flowers stuck in different fruits/vegetables. I bet a vanilla scented bloom placed in an orange would make the room smell heavenly! Love the tulips in glasses! Just my speed (and budget). I really do miss the corner convenience stores in NY with their affordable bunches of diverse blooms. Everything around here is too expensive. Bill spoke longingly the other day of a cutting garden. Maybe next year! Wouldn’t help us at this time of year though. See you next week!!!!! Can’t wait!!! I have heard that a lot do flower shops have closed in newbyork in the flower district. I guess we can blame the Costco and home depots for that out here but what explains the NYC closures? The little guys can’t compete. How is your itinerary shaping up for the NYC visit? I am still trying to figure out how I can hitch on to the caravan of fun! These are such imaginative ways of displaying flowers. I simply love the flower stalks in fruit…excellent! I may try that someday when I entertain…great idea! Lovely arrangements. 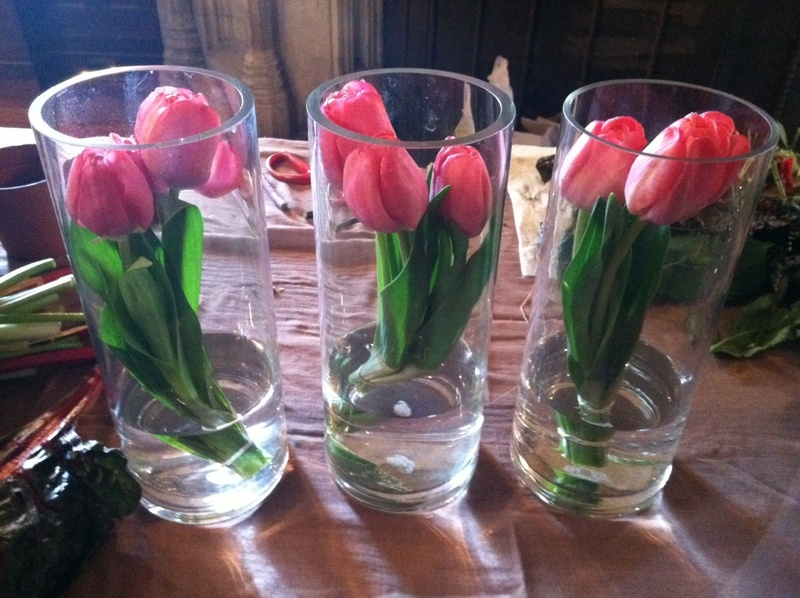 I love the tulips in glass as well!! My husband gave me a beautiful french tulip arrangement for Valentine’s Day!